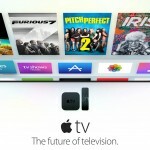 Apple has announced its latest vision in connected theater technology, the fourth-generation Apple TV. 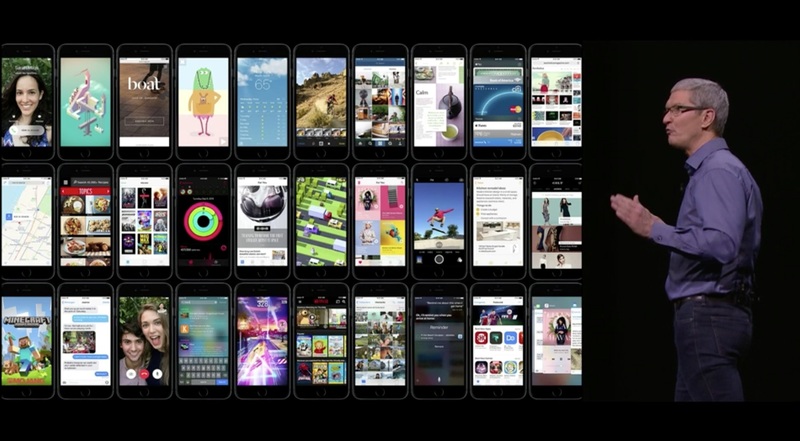 “We believe the future of television is apps,” according to Apple CEO Tim Cook. Representing a monumental upgrade over previous generations, the new Apple TV is feature-packed and should be able to hold its own against Roku, Amazon Fire TV, and even some console gaming platforms. Eddy Cue gave us more details about the new Apple TV. The set top box itself looks similar to the old generation of the Apple TV, but is thicker to support all of the internals. 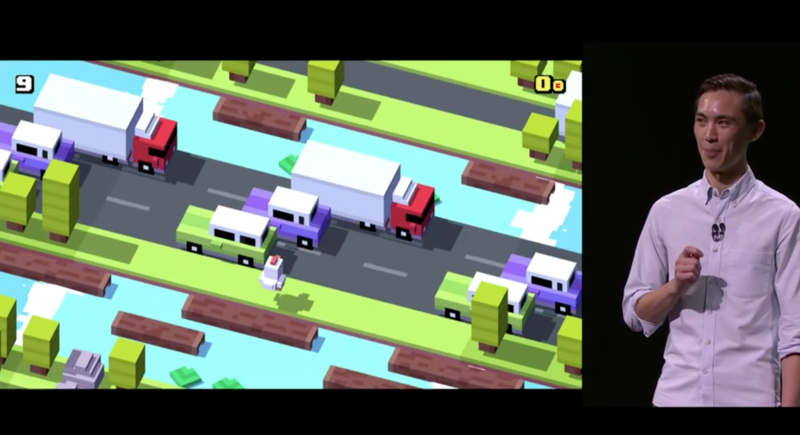 In addition to iOS classics porting to the Apple TV, there will also be exclusive titles. 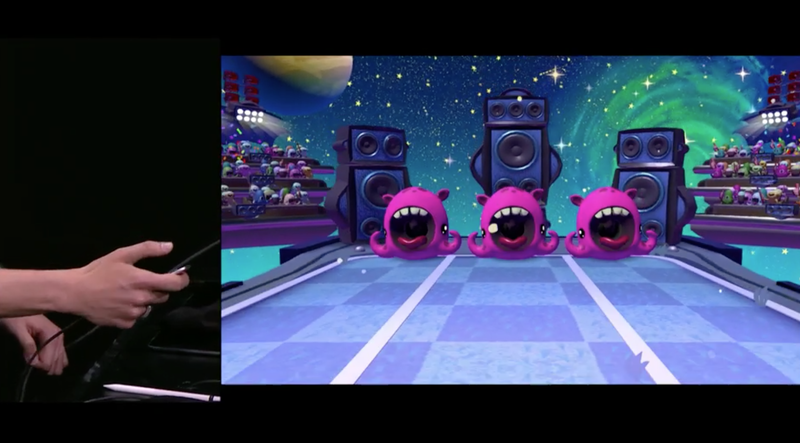 Harmonix, developers of Guitar Hero, will be releasing Beat Sports exclusively to the Apple TV. It’s a fun-looking casual title that uses the motion detectors within the remote to control the action. For multiplayer action, the game is also able to use an iPod touch or iPhone to support up to four players. 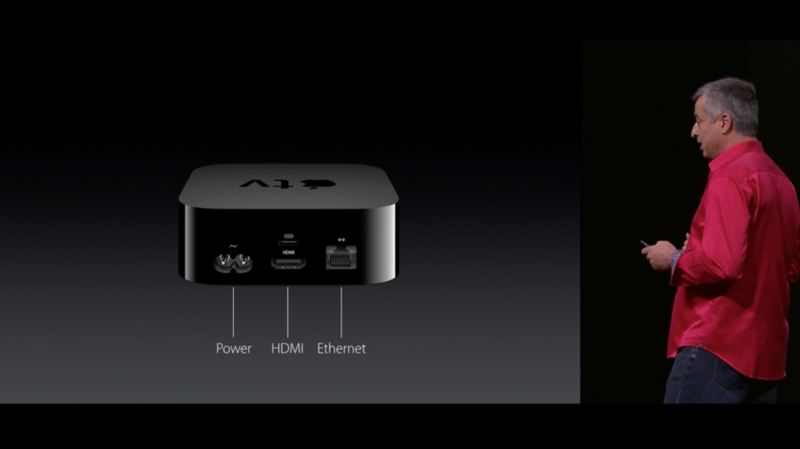 The new Apple TV is powered by a 64-bit A8 processor with a modern operating system. It supports Bluetooth 4 technology, and features 802.11ac networking for the fastest possible connection. It has a power port, HDMI, and Ethernet jack on the back. 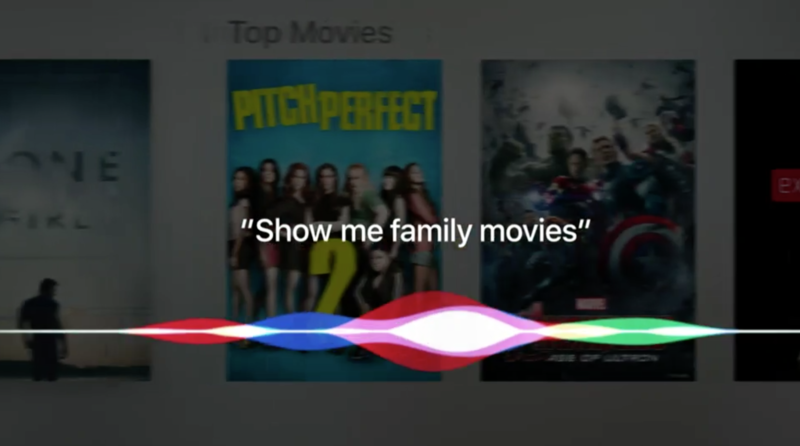 As widely expected, the new Apple TV features Siri support, along with universal search. This means you can finally tell your Apple TV what show you want to watch, with voice control, and it will search through multiple channels to find that movie or television program. 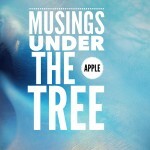 Initially, the search will support iTunes, Netflix, Hulu, and more are coming. It looks and sounds fantastic, and I can’t wait to use it for myself. Siri’s even useful when you are watching your show, since you can instruct her to skip forward or backward. You can even say, “What did she say?” to Siri, and she will skip back 15 seconds and temporarily turn on subtitles. The latest generation of the Apple TV uses a new operating system, dubbed tvOS. This operating system brings in many features from El Capitan, including transparency. One of the most important things tvOS will allow is third-party app development, so we should start to see games and other software appear for the Apple TV. The tvOS operating system is available for beta use today. Apple has finally ditched the old silver remote control, and has devised a new one with both simple buttons and a touch pad on one side. 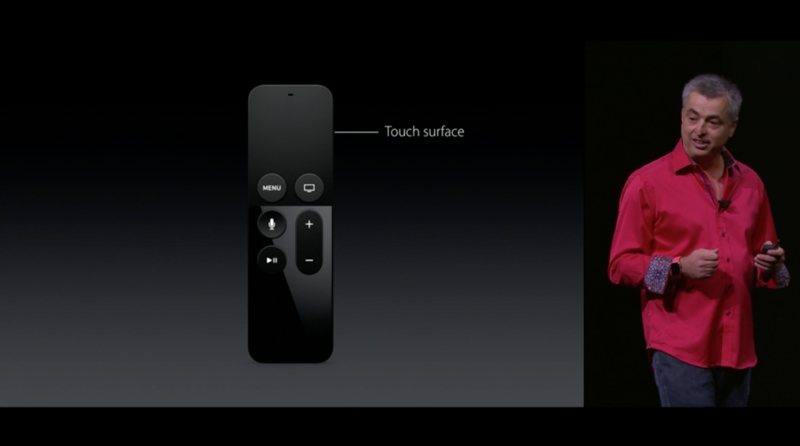 The remote also features a Siri button, allowing you to activate the voice assistant. Thanks to Bluetooth 4 technology, the remote control can utilize accelerometer and gyroscope to allow gamers to use the accessory as a steering wheel for racing games, for example. The Apple TV streams video at full HD resolution, with a speed of up to 60 frames per second. 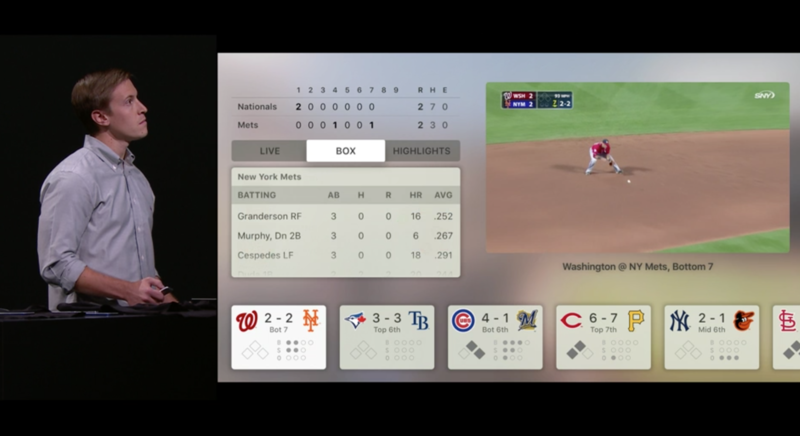 Television apps, such as MLB.com At Bat, will support notifications for breaking news while you’re watching a big game. NHL Game Center Live for Apple TV was announced for 2016. The apps make live television interactive with access to statistics, breaking news, and more. Starting at $149 for a 32GB or $199 for 64GB, the new Apple TV is right up the alley for both serious television enthusiasts and casual gamers. Available in late October, this device should give both Roku and Nintendo a run for their money, and I look forward to seeing what else app developers come up with for the new home entertainment accessory. The new Apple TV will be available in late October.